Use camera flash as a strobe light or as a flashlight. 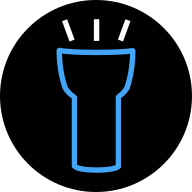 Free strobe light/flashlight android app with support for multi strobe lights for enhanced visibility at night for walkers, runners and skaters. Supports using the device LED flash as a Stroboscope!